They know that if they say a day is “slow” or “quiet” the situation will rapidly change. 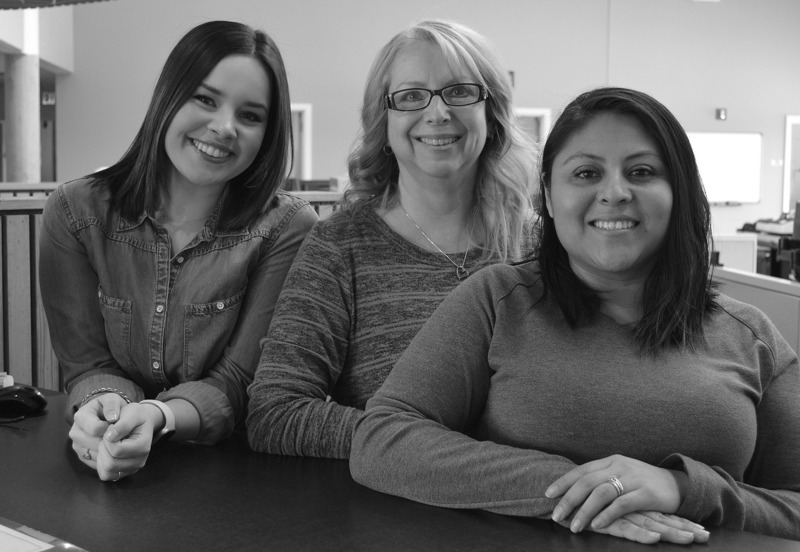 As the faces and voices of the PUD, Haley Red Cloud Windsor, Laurie Layton and Lili Garcia spend most of their days working with the public at the PUD office counter or over the phone. When you need some kind of help or change at the PUD, these are the first people you are likely to talk to. New service, changes in service, repairs, a billing questions and much more, these women work to make sure you get the help you need—and, as often as possible, that you are smiling when you are finished. Sometimes the customers they work with definitely aren’t smiling when the conversation starts. In the wake of our cold, snowy weather this year, many of the situations recently have taken the form of bigger than usual bills. The PUD’s Customer Service Representatives can ease that situation a bit by helping work out extended repayment plans to spread out the repayment time. In situations like this, it’s best to communicate early rather than wait for the power to get shut off. Once the power is shut off, an additional $110 in cutoff and restart fees is added to the outstanding bill, so it’s better to work out the problem beforehand. New technologies are helping the Customer Service staff be more efficient. For example, Haley has been taking lead in implementing automated check scanning that speeds payment processing. The scanner reads information like amount and account number and applies the payment to the appropriate account. “One thing we would like to get out there to customers is to make sure they get all of their account information updated and correct,” Laurie says. Some customers are still using their old numbers, which could cause problems and delays in applying payments. It is important to either use the payment stub from your bill, or write the new number on your check. If you don’t know your account number, the Customer Service Representatives would be happy to help. The majority of calls to Customer Service today are payments, but technology will soon help with that, too. When Laurie started with the PUD in 2004, you couldn’t make phone payments. Today, she estimates 75 percent of their calls are payments. “The phones just ring constantly and consume a lot of time,” she says. However, more customers are becoming aware of the Interactive Voice Response (IVR) system, which makes payments without Customer Service intervention, allowing them to spend more of their time on more complex customer needs. For example, they can help analyze bills that seem unusually high for no obvious reason. In some of these cases, added insulation or other conservation measures can help reduce those bills and the PUD Weatherization Department can help. The rare quiet day (knock on wood) is catch-up time. “We catch up on work, filing applications, correcting applications, dealing with return mail, address changes, the tickler file, getting delinquent notices out, keeping up on broken arrangements,” Laurie says. And they support one another through the day’s challenges. The PUD Customer Service Representatives play another important role, beyond helping with power needs. Customers know them, too, and may bring in special treats at Christmas or other times. Lili has been teaching Haley some Spanish and when Haley greeted one gentleman in his native language, he brought chili peppers in as appreciation for her efforts to understand him. They save stamps from the mail for another customer who uses the stamps to raise money for a veterans cause. “There’s no replacement for personal interaction,” Lili says. Please be sure to use the current number when referencing your account in payments to assure payment is credited correctly. If you need to make special payment arrangements, please contact the PUD as soon as possible. If power is cut off, extra fees can apply. Payment assistance is available for qualifying customers through Mid-Columbia Community Action at 312 E. Fourth St. in The Dalles, or call (541) 298-5131 for details. You can help fellow PUD customers who struggle with making payments by contributing to the Neighbor to Neighbor program. Sign up at the PUD.